In general, strength of concrete means compressive strength and flexure strength. In both cases, load is applied on concrete specimen at certain rate and applied until failure occurs. The range of usual speeds that are applied has significant effect on apparent strength of specimen. It is very interesting to see that the lower the rate of strength increase, the lower will be measured strength. A probable cause can be included here that slow increase produce creep in sample which allow strain increase with time (creep means increase in strain under sustain load) and when strain reached limiting value, failure of specimen occur. At first we will discuss about compressive strength; applying compression loading over a (30 ~ 240) min period yield failure 84% to 88% of ultimate strength derived by applying loading rate 30 psi/s (0.2 MPa/s, approximately). Depending on variation in loading rate concrete may even withstand stress as low as 70% of strength derived by loading rate of 30 psi/s (0.2 MPa/s). Above Figure shows variation of strength with rate of applying compressive strength over a wide range of 0.1 psi/s to 107 psi/s [plot is SI unit]. It is interesting to notice that with this range apparent strength becomes double. Now we are discussing about loading rate; does concrete member may be subjected to such rate loading? Raphael’s (1984) study on concrete was applied in dam; he suggested that increasing rate of compression loading by 3 orders will produced an increase in strength by around 30% which resembles to earthquake loading. Practical loading rate on compression specimen lies between 10 ~ 100 psi/s [0.07 ~ 0.7 MPa/s]; in this range strength may varies from only (97 ~ 103) % of strength yielded by load rate of 30 psi/s. if test results of two specimens have to be compared, we have to test both specimens under standard rate of loading. ASTM recommendation-the loading rate for compression test specimens according to ASTM C39 is (20~50) psi/s [ i.e. 0.14~0.34 MPa/s]; but up to first half higher loading rate may be maintained. According to BS 1881: Part 116 a loading rate of (30~60) psi/s [0.2~0.4 MPa/s] is standard and has to be kept constant throughout the test. Identical effect of loading rate is also observed in flexure strength. Increase in speed of loading in outer-most fiber of beam to be examined from (0.3 ~19) psi/s [2~130 KPa/s] yield increase in modulus of rupture by approximately 15%. 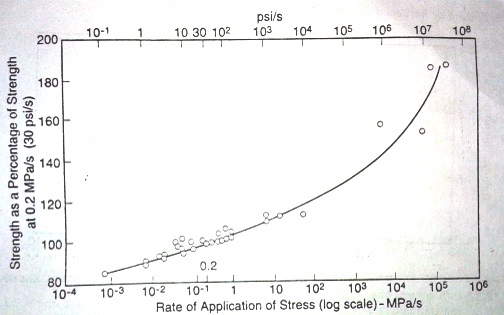 Modulus of rupture of concrete increase linearly with logarithm of rate of stress application on specimen, but a deviation is observed at very high rate; at that stage rate of strength increase is observed even becomes greater as shown in above figure as that for compressive strength.At loading rate of 24700 psi/s (170 MPa/s), the modulus of rupture will be (40~60) percent more than at 3.90 psi/s (27 KPa/s). According to ASTM C78, rate of stress increase in outermost fiber of test beam in flexure should be (2~3) psi/s [15~20 KPa/s]. According to BS 1881: Part 118, this rate should be (3~14) psi/s [20~100 KPa/s]. After this long discussion about strength, lets learn about influence of strain; here we will discuss about tensile strain capacity. When mass concrete is of our interest, we have to know about this parameter as it control cracking in such concrete.Tensile strain capacity depends on rate of stress increase; McDonald and Liu found that when loading rate is slow say 25 psi/week (0.17 MPa/week) strain capacity is found (1.1~2.1) more than that at loading rate of 0.7 psi/s [5 KPa/s]. • Varies with modulus of elasticity of concrete, increase is observed greater when modulus of elasticity is less. Regarding compressive strain capacity, Dilger et al. was reported that when strain is increased at slow rate, compressive strain capacity is increased. 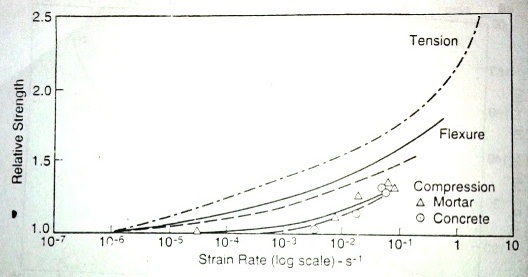 Above figure shows effect of strain rate on different types of strength. This influence is largest in direct tension loading and least in compression loading. Flexure strength takes intermediate position. Usually the stronger the concrete, the lower sensitivity of concrete to strain rate.